The UF/IFAS Extension Natural Areas Training Academy (aka “NATA”) is currently offering 2 National Wildfire Coordinating Group (NWCG) training courses taught by experienced Florida prescribed fire managers. The benefit of taking these courses with NATA? We have great instructors! Past students overwhelmingly indicated on their course evaluations that they greatly appreciated the variety, experience, and knowledge of the instructors – with comments such as, “Great instructors, they kept things interesting and facilitated great open discussion when appropriate”, and “What I liked most about the training was the instructors enthusiasm about the course and how they related the material to their own experiences”. S-131 Firefighter Type 1 will be held June 13th in Gainesville, FL. This course designed for individuals currently qualified as a FFT2 desiring to be qualified as a Firefighter Type 1 (FFT1) or Incident Commander Type 5 (ICT5) in the National Interagency Incident Management System: Wildland Fire Qualification System Guide (PMS 310-1). Note: S-133 is no longer offered and material has been combined into the S-131 course. This course is designed to be interactive in nature. It contains several tactical decision games designed to facilitate learning the objectives and class discussion. Topics include fireline reference materials, communications, and tactical decision making. S-215 Fire Operations in the Wildland Urban Interface will be held June 14-15th in Gainesville, FL. 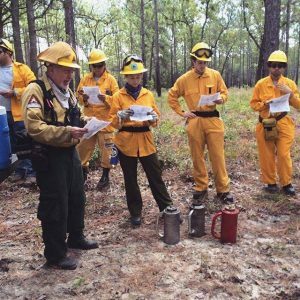 This course is designed for individuals currently qualified as a FFT1 with knowledge of their agency firefighting policy as it relates to wildland/urban interface fires. It is designed to assist structure and wildland firefighters who will be making tactical decisions when confronting wildland fire that threatens life, property, and improvements, in the wildland/urban interface. Instructional units include interface awareness, size-up, initial strategy and incident action plan, structure triage, structure protection tactics, incident action plan assessment and update, follow-up and public relations, and firefighter safety in the interface. Share this flyer or contact us for more information. Registration closes May 15th, or until capacity is reached! Shelly is the statewide Program Coordinator for the Florida Master Naturalist Program and a State Specialized Extension Agent with UF/IFAS Extension.